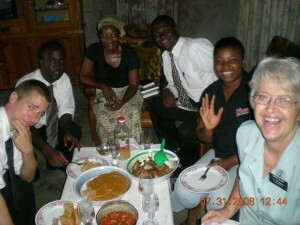 We have a fairly active group of member Branch missionaries here in the Cotonou Branch. Monday is P (for preparation) day for the full-time missionaries. That is the day we wash the clothes, clean the apartments, and the elders write home to parents, etc. (Soeur Black and I have the luxury of communicating any time we like). Also physical activity is encouraged. In Africa that means football (we would call it soccer in the US). 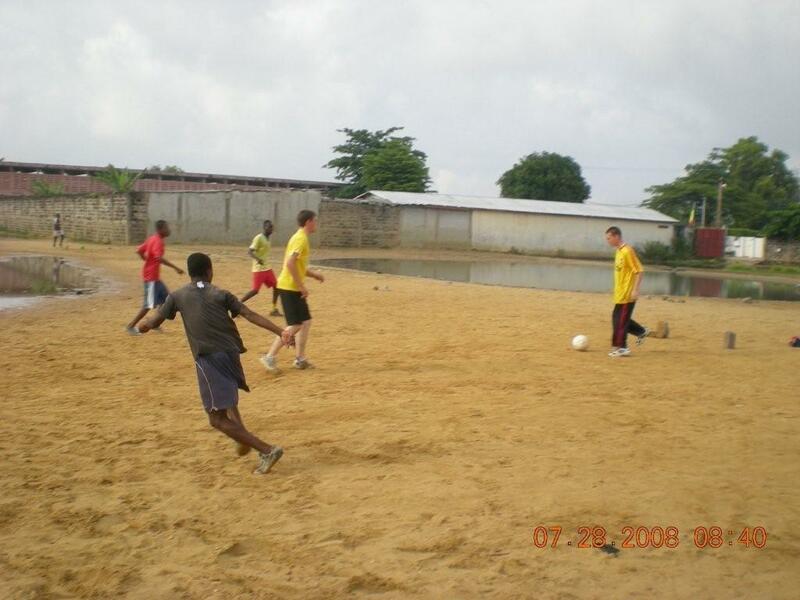 Between the branch missionaries and the full time missionaries there was a movement afoot to play soccer on Monday morning. Soeur Black and I went along as interested observers. About a dozen of the branch members showed up. There is a little football field not too far from the chapel that is apparently available on a first come first served basis. 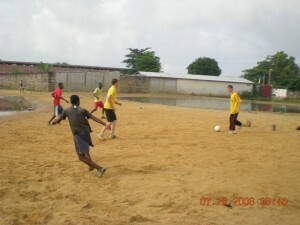 It was half covered with water from recent rains, but there was enough room in the sand to play, so those who were physically fit enough played. 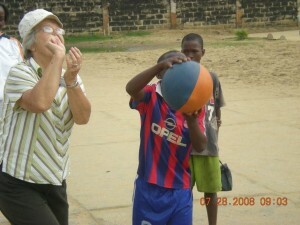 The rest of us watched and shot a few baskets at an adjacent basketball hoop that badly needed some repair. We hadn’t been playing our game or Horse very long before quite a group of young boys assembled and were useful in chasing lose balls, as the sisters weren’t too good at making baskets. Soeur Black only made it because she talked some of the boys into taking her turn, although it didn’t take much talking. The mighty might in the picture with no shirt was a dead eye with the basket. Soeur Josephine and her Sister in Law, Victorine (the one who lost her husband last week) showed up and seemed to really enjoy the activity. 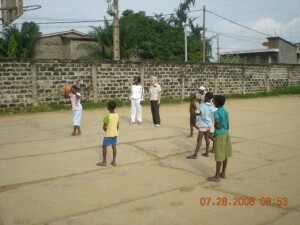 We were really surprised to see them come and thought that they were there to observe and just brought her son to play. They were dressed in very nice dresses then before we knew it off came the dresses and they had on sports clothing complete with tennis shoes. It was like my hospital experience. You just start to peel off your clothes and no one looks or even cares for that matter. It turned out to be a really nice branch activity. We also usually try to have a nice dinner for the Elders on P day since they do not often get invited out. As we have said before, they take turns doing the cooking and bottle washing. Elders Phillips and Schwieger were on duty this week and proposed a good American dinner with chicken and mashed potatoes. They also very casually suggested maybe even apple pie. We didn’t get quite that far, but Soeur Black was able to find some really nice Granny Smith apples at the supermarket and made a great apple crisp that everyone enjoyed a lot, especially me. Maybe I won’t come home as skinny as I once thought I would. We hinted last week about Frere Pierre and Rosemund and their new baby. We picked her up and took her to the hospital last Wednesday evening and the baby was born C section on Thursday morning. 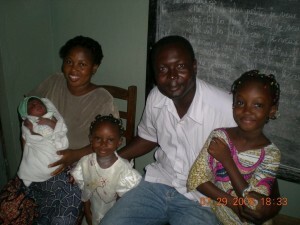 When we went to get her, Soeur Felicite, the Relief Society President, was there. She is a midwife, and we found out later stayed with Rosemund the whole night and helped in delivering the baby. Little Pierette Emanuella is the cutest little girl, about 9 lbs and just a perfect little angel. She joins two other sisters, Elizabeth and Cecilia. We also took Sister Rosemund some food. Around here if you get anything to eat in the hospital someone has to bring it. The good news is when you check out the bill is figured in hundreds instead of thousands. They went to a fairly nice hospital, however, and I think the bill did come to something over $400 which is a lot of money here. Also the way they have of enforcing payment is that you cannot get out of the hospital until the bill is paid. When we went to pick them up, we waited in the car almost an hour until Pierre was able to convince them that he had made payment. We thought for awhile we were going to have to take her back into the hospital and leave her there but finally Pierre rode his moto back to his house and came up with all the receipts to prove he had paid, and they let her go. We were glad because her room was on the second floor and there is no elevator. Women are tough over here but still climbing two flights of stairs three days after having a C section is asking quite a bit. That is exactly what she did, however, the next morning when we took her for a checkup. I carried the baby while Pierre helped her and just cringed with each step she took. On Thursday we made our regular outside run with Elder Adou and Foucher and Soeur Nadia to teach Mama Rosemond and go to Calavie to teach Mama Julianne. This time we took Frere Geoffry, the first missionary from the branch who just returned from his mission with us since he speaks Fon. 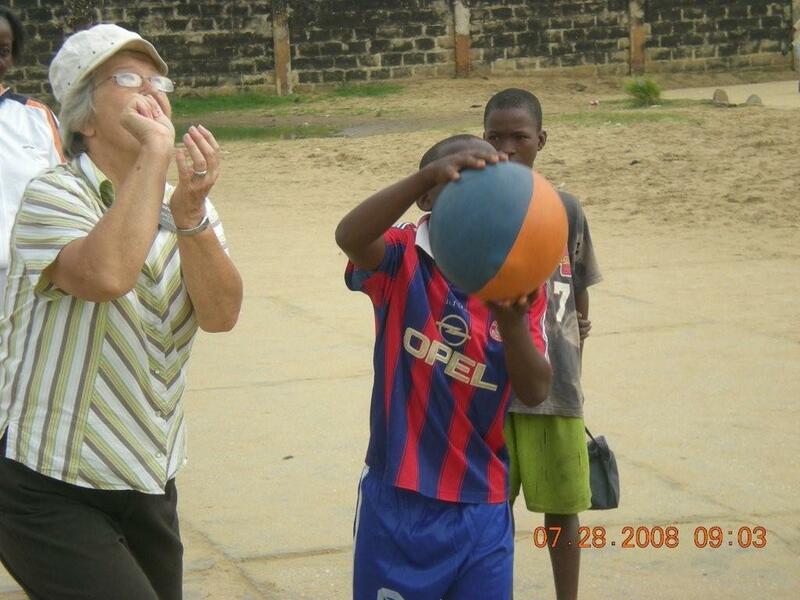 As we have said before, both are mothers of missionaries from the branch, serving in Ivory Coast. There were a couple of surprises, however. By way of explanation, any older person is addressed by mama or papa so instead of Elder and Sister that is how we are frequently addressed. First when we arrived at Mama Rosemond’s she said it would be a few minutes so we waited and visited and she finally came for the lesson. As soon as the lesson was finished she got up and started to put a feast before us. There was no intestine soup here and everything was absolutely delicious. She made a big bowl of pate rouge which is corn flour and tomato paste mixed and cooked in a pan. It was accompanied by a sauce of fresh tomatoes, onions and piments. She had a big bowl of fried rabbit and one of French fries. After that she served fresh papaya and bananas. We like those kind of surprises! We have mentioned going to Calavie before and we thoroughly enjoy seeing Julianne every week. He speaks Fon so he was able to teach her in Fon so she could read his lips just fine and we could skip the translation process with Nadia. It was really fun to sit there and hear both of them teach the gospel taught in Fon. Once in a while they filled us in on how she was responding. She really understands the gospel despite her hearing handicap. Elder Geoffry was obviously an excellent missionary and really knows how to teach. We couldn’t understand the Fon but I could the French when he was helping to teach Mama Rosemond and discovered that the same thing happens to these African missionaries as happens to American missionaries when they go on a mission. They come back mature adults with a good knowledge of the gospel and how to teach it to others. I hope the same thing happens to Soeur Black and me. Soeur Black’s Birthday was August 1. 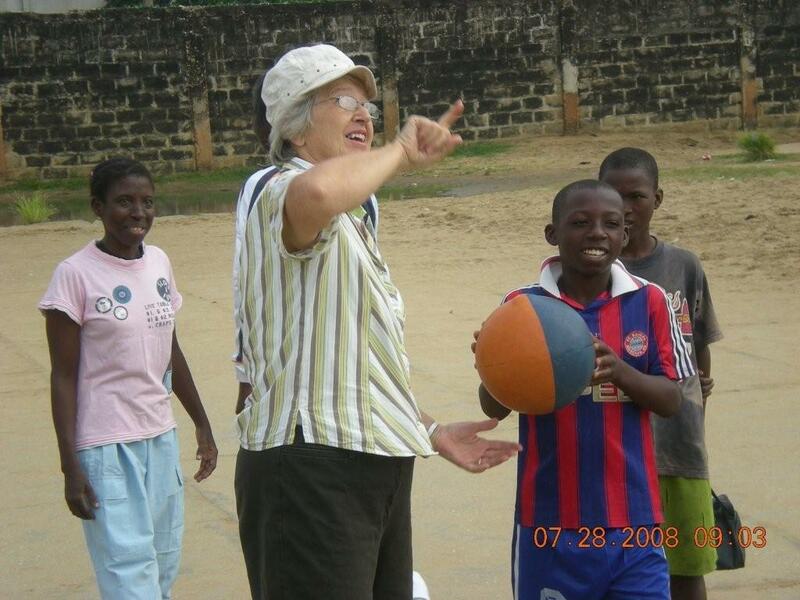 As the word spread a little she received lots of birthday wishes from members and missionaries. We pretty much took the day off just doing things that needed to be done here at the apartment then drove around looking for a missionary apartment in Akpakpa and went out to a nice dinner. August 1 is independence day here in Benin so most things were closed and there were celebrations going on here and there.